For deciduous (baby) teeth, becoming loose and falling out is a natural process; it needs to occur so that your baby teeth can be replaced by a permanent (adult) tooth. However, when permanent teeth become loose, this is cause for concern, and should see you make an appointment with your dentist as soon as possible. 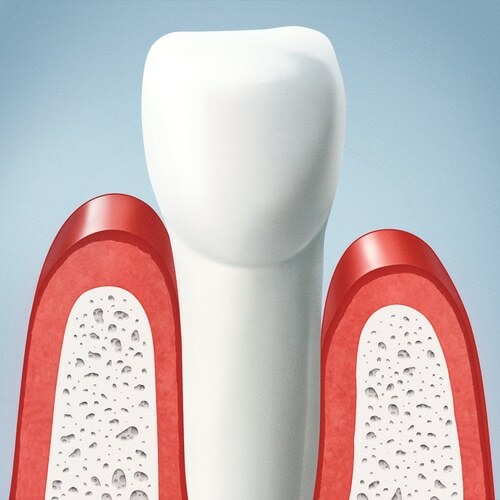 Periodontitis (gum and bone disease): if left untreated, periodontitis destroys the small periodontal ligaments and the bone that holds your teeth in place. If enough bone is destroyed, then your teeth have nothing in which to sit. Eventually, your teeth will become lose and may fall out or need to be extracted by your dentist. Oral trauma: trauma to the teeth such as a heavy knock can stretch the small periodontal ligament fibres that attach your tooth root to your gums and surrounding soft tissues. When these ligaments are stretched, your teeth can feel loose. If the trauma has caused a fracture in the root of your tooth, this can also cause mobility. Another, very common, form of trauma to the teeth is nocturnal bruxism (teeth grinding and clenching). Grinding and clenching puts an enormous amount of pressure on your teeth and periodontal ligaments, which can lead to a feeling of loose teeth when you wake up in the morning. Missing teeth: if you have multiple teeth missing in your mouth, your remaining teeth are subjected to a greater amount of pressure. In effect, one or two teeth are expected to do the same amount of work that several teeth would usually take care of. This heavy load can put undue pressure on your teeth causing them to become mobile. Infection or an abscess: an abscess around a tooth can cause looseness as it results in bone resorption and soft tissue attachment loss. The cause of your loose teeth must first be identified before the appropriate treatment can be decided upon. Dr Danylak will determine the cause of your loose teeth based on a thorough examination, which may even include x-rays. Once the cause is determined, treatment will then be prescribed. For instance, if gum disease is causing your loose teeth, then this will need to be managed appropriately by your a dental hygienist or dentist. If the cause is bruxism, then a splint can be worn at night to protect your teeth. And, abscesses can often be resolved with either antibiotics or root canal therapy. And, if your loose tooth cannot be saved, missing teeth can be replaced with: dentures, bridges and implants. Your dental professional will assess and manage you individually. Why treat a loose tooth?